Ideal for Thin Films: These RRDE tips feature a fixed PTFE separator between the disk and ring that facilitates drop casting of thin films. 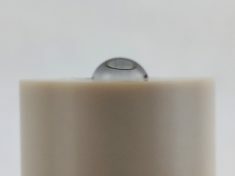 The PTFE separator is more hydrophobic than PEEK and is more effective at preventing water droplets from spreading off the disk and onto the shroud. Highest RRDE Tip Collection Efficiency: The E8 series RRDE tips contain an ultra-thick ring, giving it the highest theoretical collection efficiency among commercially-available RRDE tips - 43.9%! 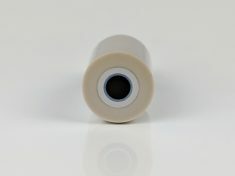 High Temperature Stability: Even with the PTFE separator, this RRDE tip contains a robust PEEK shroud that is ideal for applications where the RRDE tip undergoes routine thermal cycling. Contact Pine Research if you need the electrode disk and/or ring made from another material. Common materials include aluminum, copper, iron, nickel, palladium, tungsten and various steel alloys. TEMPERATURE RANGE: 10°C – 80°C — Electrode damage may occur at temperatures beyond recommended range. CHEMICAL INCOMPATIBILITIES: Concentrated Strong Acids — Damage or discoloration may occur. Polishing PEEK-shrouded electrodes is best accomplished using a mechanical polisher. Other shroud materials are available upon request. Ideal for Thin Films: These RRDE tips feature a PEEK shroud which is designed for use over a wide range of temperatures (10°C to 80°C), but also a fixed PTFE separator between the disk and ring that facilitates drop casting of thin films. 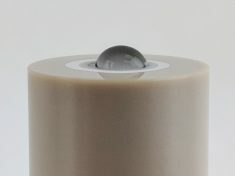 The PTFE separator is more hydrophobic than PEEK and is more effective at preventing water droplets from spreading off the disk and onto the shroud. Highest RRDE Tip Collection Efficiency: The E8 series RRDE tips contain an ultra-thick ring, giving it the highest theoretical collection efficiency among commercially-available RRDE tips – 43.9%! High Temperature Stability: Even with the PTFE separator, this RRDE tip contains a robust PEEK shroud that is ideal for applications where the RRDE tip undergoes routine thermal cycling. These RRDE tips have a 15.0 mm OD shroud and are designed with the same thread connections as our standard 15.0 mm OD RDE tips, making it easy to switch between RDE and RRDE configurations using the same rotator shaft. 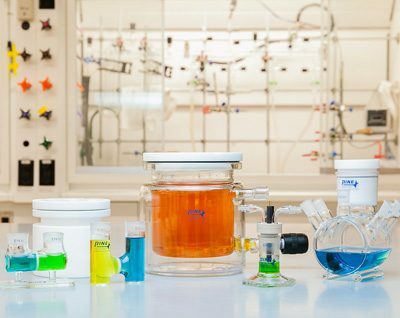 Designed for experiments like fuel cell electrocatalyst screening, these RRDE tips provide the platform you need to study catalyst behavior over a range of temperatures. 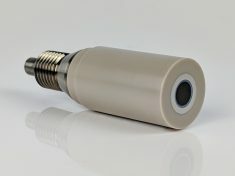 Compatible shafts include AFE6MB, AFE6M, and AFE5M for use with the MSR rotator, AFE6A and AFE5A for use with the ASR rotator, and AFE5F for non-rotating applications. 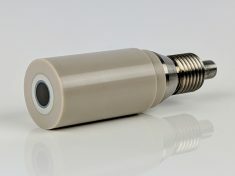 The E8 Series RRDE tips are also compatible with the WaveVortex 10 Electrode Rotator.